Extreame Savings Item! 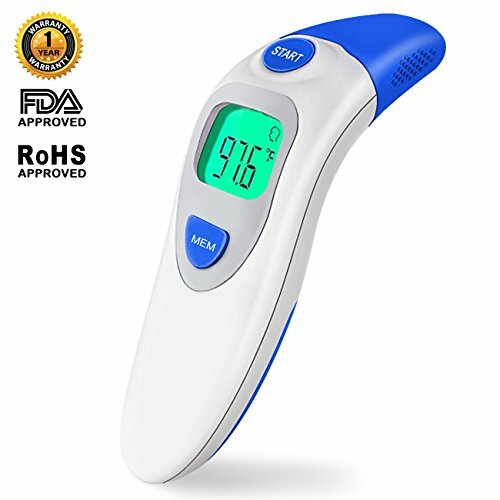 Save 48% on the Thermometer for Fever Digital Medical Infrared Forehead and Ear Thermometer Professional Suitable for Baby, Infants, Toddlers, Adults, Objects and Ambient with More Accurate (Blue) by Ailicici at Veteran Parenting. MPN: Baby Thermometer. Hurry! Limited time offer. Offer valid only while supplies last. Ailicici Digital Thermometer For Fever Medical Infrared Forehead Thermometer And Ear ThermometerExtensively Clinically, Tested CE And FDA Approved. if you suspect you have a clinical issue. How to cancel the thermometer beep sound? 1.When the thermometer is turned on, long press the MEM button and release it after you hear a beep sound. 2.Press the "MEM" button for 6 seconds then release. Either C or F will appear in the lower right corner of the display. QUICK AND EASY - Taking digital baby thermometer for fever infrared forehead just press a key, you will read temperature in 1 second.Dual mode, Free to switch the detection mode from Forehead to Ear which is the easiest.Forehead Thermometer (suitable for all ages) and Ear Thermometer function ( only for the child above 3 months) the easiest and most practical way to take a temperature. If you have any questions about this product by Ailicici, contact us by completing and submitting the form below. If you are looking for a specif part number, please include it with your message.